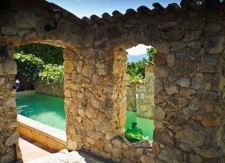 B&B La Parare is an entirely renovated stone farmhouse from the17th century. The house is all in stone, with vaults, tower and terraces and on the front terrace a heated swimming pool with jet stream. For the cold season we also have a sauna. 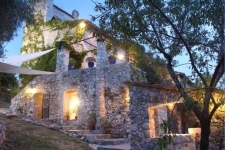 You will find beautiful scenery, calm with an open view on the mountains and an olive grove. In the morning you will be served a plentiful breakfast: homemade bread and jam, fresh orange juice, fruit, cake and fresh eggs. Every day there is a different dessert and most important €" freshly brewed coffee and a nice selection of tea. Charm & authenticity is the key and the house has been decorated in a contemporary style - between Zen and Provence. We have 4 large bed rooms/suites, individually decorated with large bathrooms and all have their own sofa corner and a fireplace. 1 €" 2 times per week we organize dinners and it's also possible to have a massage (to be ordered in advance). Conveniently located 35 min from Nice Intl airport, on an easy distance from the coast as well as the mountains and all the lovely places there is to visit in the area: Monaco, Nice, Antibes, St Jean Cap Ferrat and many more.